Roy updates his rolling 22 on the back of the newly announced DPPs and has a look at a few trade options for the week. The DPPs have dropped and one has slipped straight into third spot for his new position. Who to bring in? Shannon Hurn (DEF, $597,000) although he is not in the rolling six, Hurn deserves some credit here and is an option for coaches that don’t have the cash to reach the big boys. He is averaging 93 on the season and an impressive 101 in the last three games and has only dropped under 93 once in the last six weeks. This week he comes up against the Dogs who he pumped out a lazy 118 on earlier in the year. He is having a career year. Who to bring in? Jack Macrae (MID, $781,000) Common sense says to wait on this… given the fact he has a break even of 161, but if you have the cash and its your final upgrade in the midfield, I would jump now at this stage of the season. He took no time bouncing back from his hamstring injury with a dominant performance against the restrictive Demons with 133 from 33 possessions, seven marks and eight tackles. He plays the Eagles this week who he had a nice 134 on in round two earlier in the year. Who to bring in? Rory Sloane (MID, $595,000) looks great value for a player we all know has the potential to be a genuine premium. He has returned from injury in impressive form with back to back scores of 111 which gives him a break even of just 82. I like the fact he is unique with an ownership of just 3% and he has dropped $159,000 from his original asking price, so the value is there. My only concern he is that Berry has been tagging very well for the Lions and he would have Sloane locked in as his target at the GABBA this week. Who to bring in? Patrick Dangerfield (FWD/MID, $660,000) slots straight into the rolling 22 as a forward with an average of 102 for the season. Although he is producing a shadow of what we have seen in the past couple of seasons, the fact he is capable of beast mode 150’s like we saw this week against the Crows make him a must have forward. He has dropped $189,000 since the start of the season and has a break even of just 82 leading into this weeks game which suggests you won’t get him this cheap again this season. Colin O’Riordan (DEF, $202,000) has been a NEAFL Pig this year and he took his form to the top level with an impressive 84 on debut. The Irishman gathered 17 possessions and took seven marks, while also laying an impressive five tackles. The job security and cash generation are both there, so don’t hesitate bringing him in. He has a BE of -11. Trading out Doedee for a mid under $670k and I was thinking Heppell, but is it better to go Heeney who will probably be a top 6 forward come year’s end whereas Heppell is unlikely to be top 8 mid? Therefore, Heeney would sit in my mid until I upgrade Taranto. Heppell should be considered to be a top 8 mid if Sloane is. Hes numbers are phenomenal. Rockliff or Wingard or Taranto to Crouch. Same 3 to Macrae and giro to 170k rook. Tough call Anth, could be a tough game for all 3 on Sunday.. Rocky could go a tag with Kelly/Cogs or a defensive FWD to play on Whitfield, and Wingard could be asked to play a FWD role to cover Gray. I’m probably looking at moving Rocky next week, so he’d be my first out from those 3..
I’d be avoiding Macrae this week given how well Hutchings has shut down players this year and he didn’t pay Rd 2, so Macrae has come up against him yet.. Currently have gone Banfield (via Smith) to O’Riordan and Guelfi to Danger putting Ahern to the mids and Narkle to Fwds bench. Dang.. I’ve got 10 of the 12 FWD/DEF players, but I traded out Hurn last week to bring in Pendles thinking he’d outscore the Eagles captain easily..
Had 4 MID from last weeks top 8 but only 2 this week too, sheeeet.. Selwood, Zorko, Sidebottom all out with only Zerrett in for me, although Oliver must be M9 if there was one..
Any one else heard the rumour Sic Dawg has a wrist injury and out for up to 4 weeks? Is that because he jerks off too much when watching his own highlights? Yep broken wrist gone for rest of DT season. Thoughts for my final mid for the price range? I’ve gone Curnow for his outstanding draw during DT finals. Could backfire, but he’s likely to be semi-unique. In order after that I reckon Sloane, Steven, Phillips, Wingard, Langdon then Greene. First two are mighty susceptible to tags, so Phillips probably safest. But for the price, it’s hard to go past Sloane. Almost no risk there. Upgrade rocky, parker or adams to up to 739k mid? Got Mitchell, curnow, crouch, danger, merrett. Scrap that. Looks like ill be trading out sicily! Who should I trade first out of Buddy and Rocky? Franklin’s 5-round average is 11 points lower than Rocky’s if that helps? Similar dilemna for me GG.. Had a McInerney downgrade and Telly upgrade, but need to fix Sicily and want to upgrade Mr Steele to one of the Top 8 MIDs above..
Hey GG, where are you seeing Sidebum listed as a test? In Fantasy he’s got the injured symbol, but there’s no mention of him at all on this evening’s Official Injury List …? Tough call as we don’t know what Port’s gonna do with Chingard… at least if they swing Danger forward he’s still capable of 100s. Chingard isn’t. Whitfield’s 11th on the 5-round average list. Hurn’s 79th. Was going to do my final def upgrade: doedee> simpson. But am thinking this is a growing risk. With siciky out and crisp spudding. Is hurn my best option? I Have the top 5 rolling 22 defs as well. That final spot in DEF is up for grabs for sure… I’ve gone Sicily –> Hurley to save dosh. But really it’s a stab in the dark. Simpson has a cushy draw tho. Shuey. Both get their fair share of tags and injuries, but Shuey’s cheaper. What’s wrong with Josh Kelly? What’s Zerrett gotta do to get some love? 119.4 in his last 5, don’t mind if I do. Yeah, behind only Titch and Gaff in that 5-week stretch. Tearing it up! Whitfield and Fristch or ORiordan and Danger? Which trade would you do first? I’d go number 2 this week only becuase McRae BE very high. It’s no denying that dude is tight, just feel with the stormy weather in the west and possibly a tag from Hutchings might happen, I’m getting danger in this week to complete my forward the upgrade either JOM or curnow to McRae next week. Should you really be writing articles if you didnt have Heeney already in your side…. What you smokin? Heaps of people traded Heeney when he got injured. It’s been 2 weeks. Four of the top 100 has Heeney last week. Safe to say a lot traded him when he was for concussion. “Joke”, you’re and idiot. But surely the only coaches who would’ve/should’ve traded him out are those who’re seriously trying to win the comp (or a hat). By this stage of the season all the top teams are ‘complete’ – no rooks left on the field and with playing emergencies – so for them it’s all about swapping premos as their form and availability dictates. For the rest of us (muppets) who are still struggling to get a full team of premos it makes no sense to offload a top six premo who’s likely to miss only one week. Anyone see any downsides or alternatives? Could get in Riewoldt, Armitage or Shuey instead of the rook – a gamble all playing real well at the mo with >100 3-rounders..
I’m not sure what to do with Sicily this week. I know he has to be traded out but I’m looking at players like Hodge or even B Ellis as he is starting to find form, and by picking either player you are making heaps of money to upgrade a Mid. 1. Out Sicily in B Ellis or Hodge Out Boak and In D Beams. Jaiden Short, is cheap, last 2 has gone 108, 82 and has been consistent this year. Ridley to O’RIORDIAN and Sicily to Danger? Next week then upgrade nicnat. Am I silly for thinking Hodge or B Ellis could make there debut for my team? Does anyone know where to see Cal’s scale of hardiness?? No love for Jaeger? 5 round avg of 111, 3 round avg of 108 and 1 score below 94 since r10. Finally getting lots of the footy plus sticking tackles and kicking goals. 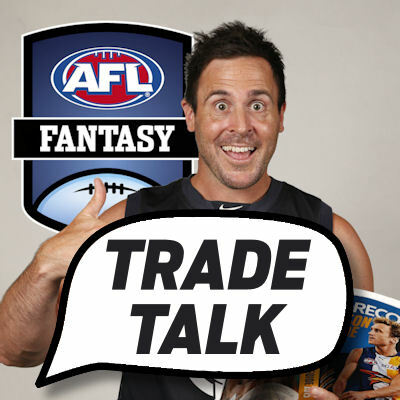 Not a great deal to discuss for me…..brought in SicDawg last week & I’ve got Nic Nat. Been pretty much the story of the season, mostly always having to cover for injuries. Currently sitting just outside top 5000. Had plans to dump Parker at long last. Plans out the door!!! Tough Nostro.. Hopefully you have Cameron on the pine and can play him for a week? Might be able to bank some extra coin somewhere to bring in Grundy/Martin next week..
1 – Laird is a must have in DEF..
O’riodan or new recruit farrell from power (or if u can suggestions of any other good debutants worth a spot) ? I’d say 2.. Cameron is an AFL unknown and with Buddy & Sinclair in the team he’s not likely to command a lot of time at either position he’s been dominating in the NEAFL..